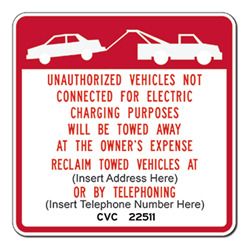 Click HERE to Have us Add your Tow-Away Info to your R112 Signs. DOUBLE the working life of your Parking Signs for Hybrid And Alternative Fuel Vehicles by adding 3M Protective Overlay Film (POF)! 3M’s high-tech POF protects sign faces against fading caused by the sun and harsh weather—and makes graffiti and sticker defacement damage easy to clear away without harsh abrasives.